﻿ What is Meant by a Palestinian Refugee? WHAT IS MEANT BY A ‘PALESTINIAN REFUGEE’? THERE IS NO INTERNATIONAL DEFINITION OF A ‘PALESTINIAN REFUGEE’. ITS MEANING IS DEFINED BY UNWRA. THIS DIFFERS FROM HOW IT IS USED BY OTHERS, FOR EXAMPLE BY UNHCR. are the only refugee group to expand. Estimates of this growth varies. A common one is from about 700,000 to over 5,000,000. All other refugee groups become smaller until they vanish. 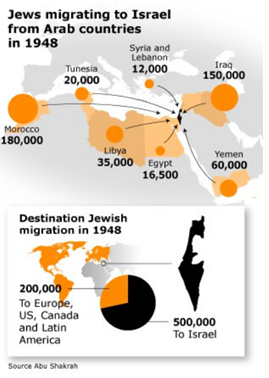 From the 1940’s Jewish communities were exiled, fled or left Arab countries. They were quickly resettled. No contributions for help with resettlement were requested from other governments. No reparations for their losses were received by them. The past 70 years have seen unsuccessful negotiations between Israel and the Palestinians for regional peace. No ‘Palestinian Refugee Problem’ would exist had Arab countries followed the same path as Jews leaving Arab countries – absorption as citizens – in the Arab country where they settled. The Arab League decided they should not be absorbed but be used as a political weapon against Israel. including refugees (refugee law), children (the Convention on the Rights of the Child), and prisoners of war (the 1949 Geneva Convention III). The US decision to withdraw its support for UNRWA raises the possibility that other countries will follow suit, and this organization will come to its end. These circumstances call for a retrospective look at the period of UNRWA’s establishment. As so happens, alongside UNRWA, which was intended to help rehabilitate the Palestinian refugees after the war, the United States transferred funds for a parallel project to aid Jewish refugees from Arab countries. This chapter of Israel’s history is forgotten for a simple reason – it succeeded. 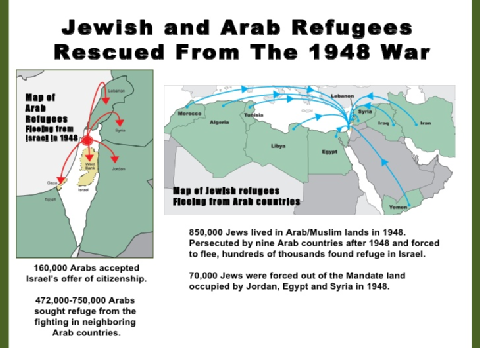 Hundreds of thousands of Jewish refugees from Arab countries were assimilated into Israel. In contrast, hundreds of thousands of Palestinian refugees were rejected by the countries that were supposed to absorb them, in a cynical move designed to perpetuate the Arab-Israeli conflict in conditions where other conflicts have long since been resolved. …………………… The UNRWA monster has become a petri dish in which anomalies have multiplied as far as the treatment of refugees goes: Palestinian refugee status is inherited, UNRWA itself is not working to rehabilitate the refugees but only involved in humanitarian aid, and a large majority of its workers are Palestinians themselves. UNRWA has become a decisive factor in perpetuating the Arab-Israeli conflict, rather than in solving it. Just as there are no Jewish Refugee who left left/fled/exiled from Arab countries in the 1940’s so there will be no Palestinian refugees. If there are no Palestinian refugees there is no need for UNWRA. There would be no discrimination by Arab countries against ex-Palestinian refugees. Since then western countries have donated an incredible amount of money in support of Palestinian refugees. Many, on both sides, have been killed/injured.